A single speed bike requires you to exert more effort and physical strength to accomplish various courses and routes. 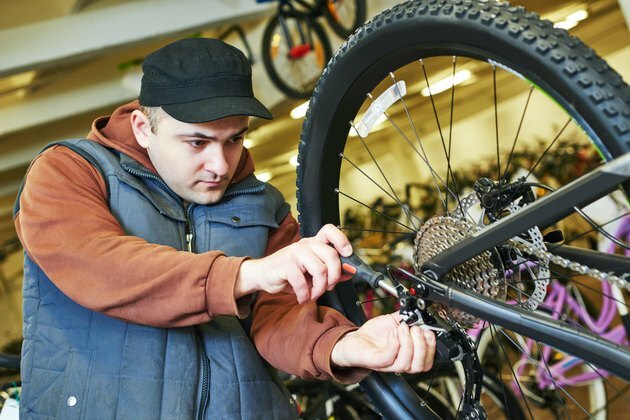 Converting your bike to variable speed provides you the advantage of maneuverability and increased efficiency, but it will also require advanced knowledge of parts and how they work together. You can invest in equipment to change your fixed-speed ride into a multi-gear unit yourself. Position your bike upside down or place it on a bike stand. Remove the chain and then let the rear tire deflate completely. If you have v-brakes or center-pull brakes, release them. Remove the rear wheel by loosening the quick-release lever or using an Allen wrench to loosen the nuts on the axle. Loosen the lock-ring of the cog set to take out the rear-wheel fixed-gear cog. Take the new variable-speed cog and align it with the splines on the hub. You should conveniently push and install the cog set on the wall of the hub. Add some grease to the threads of the lock-ring then tighten to secure the cog set. Install the rear wheel back in place and then inflate the tire. Remove the grip from your handlebars. Put the shifter pod on the handlebars and then secure it by applying the grip. Fix the shifter cable neatly along the bike frame leading to the rear axle. Install the rear derailleur to the frame and then lead the shifter to the cable slot of the rear derailleur. Put the chain on the bike and then position it in the center of the rear cog. Ensure that all the parts are working perfectly. Try shifting between gears while biking on flat and irregular surfaces. Also check that the wheel bearings are well-maintained and in good condition.